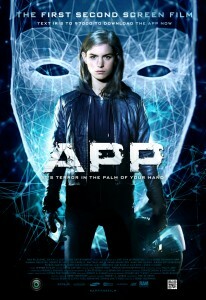 RAM Releasing has unveiled the one-sheet and trailer for APP, a film by Bobby Boermans which will be released theatrically and comes with the intentional inclusion of content on a second, mobile screen. This Dutch thriller is opening in select theaters on and VOD May 9th. APP marks the second film we're seeing on the way this year to feature a second screen option (Panzer Chocolate? is also offering a similar experience). Says a press release: "The accompanying app, IRIS, is equipped with sonic technology that triggers additional content during the movie – off-screen text messages between characters, an alternative angle in a scene, and more. Though not required for viewing the action-packed APP, the intentional use of the second screen makes it a ground-breaking achievement in the continuing convergence of film and technology." In the film, Anna lives with her best friend Sophie, and balances psychology classes with supporting her brother and his recovery following a traumatic motorcycle accident. She’s never far from her cellphone, and after a night of partying in the dorms, Anna wakes up groggy and hungover only to find that a new app has been inexplicably added to it. Initially helpful and clever, IRIS soon begins behaving mysteriously, answering personal questions it shouldn’t know the answers to, and sending inappropriate images to her contacts. When it becomes clear she can’t simply delete the unwanted, evil app, Anna’s efforts to confront it will set in motion a fearful series of events that will put her life, and that of her roommate and her fragile brother, in fatal danger. The IRIS app – text IRIS to 97-000 to download for iPhone and Android – works in any viewing environment, from multiplex to living room. The app also includes exclusive character bios and film stills.